Caulking and specific sealants help insure the integrity and water tightness of your building. Moisture intrusion is a leading cause of building exterior component failures including spalling, cracking, and delaminating facades. Interior materials such as drywall, flooring, and even ceilings are often damaged as well due to water infiltration and lack of proper caulking maintenance. Spalling and delaminating is a result of water entering brick, concrete or natural stone and forcing the surface to peel, pop out or flake off. 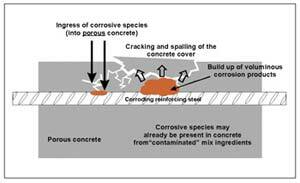 Eventually, spalling can cause crumbling and destruction of a structure. Walls and structures susceptible to water damage, including brick, split face block, stone, precast concrete and cast-in-place concrete can benefit from the application of waterproof sealants and water repellants. These products increase the life expectancy of your buildings by preventing moisture intrusion, freeze-thaw cycle damage and costly facade deterioration. In addition, your structure, and can dramatically improve the appearance of a building with glossy sealers or penetrating stains. Firestop is a passive fire protection systems of various components used to seal opening and joints in fire-resistance rated wall and/or floor assemblies, based on fire testing and certification listings... Unprotected openings in fire separations void the fire-resistance ratings of the fire separations that contain them, allowing spread of fire past the limits of the fire safety plan of the entire building. Firestops are designed to restore the fire-resistance ratings of rated wall and/or floor assemblies by impeding the spread of fire through the opening by filling the openings with fire resistant materials. Most building materials are subject to varying degrees of shrinkage and settlement as well as normal expansion and contraction caused by changes in climate and humidity. A Proactive management plays an important part in the life of your building. When a Preventive Management Program is properly executed, it will add years of service life by detecting minor problems before they become major, as well as providing better protection for your entire building. Maintenance procedures should include: Periodic physical inspections, cleaning and repairs. Inspections: Joint sealants, like other building envelope components such as the roofing system or the windows, do not have an infinite service life. In addition to the rigors of directly facing the elements, the joint sealant must withstand building movement as well. Monthly and seasonal inspections of the building envelope should be done to enable early detection. Cleaning: Keep the sealants clean of debris and abrasive material. Water can be used in moderation. However, if additional cleaning to the existing building is needed. Using any form of high-pressure water or chemicals will result in failure of the sealant. The high-pressure water will blow out the sealant from the joint, which will allow moisture and debris to enter the joint. Chemicals in any form will deteriorate the sealant at a much faster rate. Repairs: It is advisable that to protect the manufacturer's warranty, major repairs should be accomplished by the original, approved applicator. The original installer will evaluate the sealants and approach the joints for restoration. Here again the professionals must use their knowledge and experience to judge the best approach. Whether total restoration is the best approach or an alternative.